Yesterday, in my post about the debt ceiling deal, I had a hard time finding any winners or losers. Like most of you, I'm nauseated by the increasingly vitriolic partisan rhetoric from both left and right. But when I said that "centrists like Charlie Dent are in short supply in Washington," something inside partisan Jonathan Geeting must have snapped.. In a screed entitled "An Ugly Morning for America," Jonathan claims I should apologize to all of you for commending Dent's moderate style. He adds there "is no such thing as the political center anymore in American politics, and there’s no way to bring it back. It’s just not useful to think about politics in terms of personalities when it’s institutions and parties that shape outcomes." Well, then I guess the Washington Post better visit Hallmark and buy a few cards, too. According to an analysis by four of their obviously inferior journalists, "The moderate middle wins the day." And guess what? One of the grownups credited is none other than Lehigh Valley Congressman Charlie Dent, who leads a moderate group of Republicans called the Tuesday Group. In the end, after all the sausage making, the House vote was a 269 to 161 bipartisan vote to increase the debt ceiling, along with a whopping $1 trillion cut in discretionary spending over the next ten years. After his vote, Dent released this statement. “The process wasn’t pretty and the product isn’t perfect, but the bipartisan agreement passed by the House this evening will soon bring an end to the prolonged debt crisis that pushed our government to the brink of default and symbolized the dysfunction of Washington. The compromise legislation includes significant cuts to discretionary spending that exceed the increase in the federal debt ceiling, important statutory caps on federal spending and a responsible enforcement mechanism for Congress to consider additional measures to control spending. Don't tell Geeting. He's blowin' oil. Now Obama wants budget ceiling fans, too. This is the same paper that endorsed the disastrous TARP and stimulus nonsense that made the current mess possible. Next time, quote a mentally deranged retard. You'd be citing someone with more credibility than WP on matters of economics. I said you should apologize to those of us who correctly predicted that enabling the election of a Republican House majority by voting for Charlie Dent was a bad idea. And it is a bad idea. The debt ceiling shouldn't have gotten hijacked in the first place. Dent endorsed the hijacking. A Democrat would not have. It's that simple. If I'm a partisan, it's because I'm playing for Team Full Employment, and your "whopping" trillion dollars in spending cuts is going to slow GDP and kill jobs. But that doesn't matter to you, as long as some Republicans and Democrats voted for it together right? Can you please propose a solution the the ever increasing US debt? The 2008 crisis consisted of a multitude of meltdowns, because toxic assets were appearing on balance sheets all over Wall Street. Those toxic assets caused the fall of Lehman, and the buyout of Wells Fargo/Wachovia, Bank of America/Merrill Lynch, JP Morgan Chase/Bear Sterns, as well as nationalizing GM, and placing Fannie Mae and Freddie Mac into conservatorship. Do you know what the largest toxic asset is in the world? Its the US debt John. Now at 16.4 trillion, we are borrowing money just to pay the interest. Do you know that the foreign investors have slowed down their purchases of US treasury bonds that make this spending possible? Do you know the Federal Reserve has had to purchase its own US treasury bonds with new printed money? Do you see the inflation effect here? When poor people must pay $28.00 per gallon of gas just like rich people, what will you say then? This comment is not meant to slander anyone or the US govt. But this is what is going on. A treasury auction is held at certain intervals to sell US Treasury bonds to investors who pay with money. The US uses that money to pay for the difference in its intake of money, and the amount they spend. It covers the deficit spending which is about 1.5 trillion per year. Imagine I hold a yard sale to auction off my junk, for those that wish to buy it. But when none wants it, I run inside, print some counterfeit money in my room, then return outside to my sale. I bellow out the word "SOLD!" and use my counterfeit money to buy my own junk. It looks like a very successful auction, but the only person buying anything is me. The Fed is allowed to print its own money to buy its own junk. Nothing like an immature blogger from NYC throwing a temper tantrum. Bernie, you might want to check out Patch to watch Geeting try to reinvent himself. Yesterday's quote was a classic - "I'm a generalist political blogger, I'm not an expert." Hah! He's been putting himself out as an expert on everything under the sun, and sinking into the gutter of personal ridicule and tasteless sexual innuendo when anyone dare disagree with him. And now he says he's a generalist and not an expert? Sorry Geeting, you do not represent the beliefs of the Lehigh Valley or the Nation. You are so far out on the fringe it's ridiculous. Charlie Dent should not have voted for this bill. It did not address the matter of baseline budgeting. The cuts are not really cuts parricularly when you consider that they did not put them into place immediately. This legislation is so bad that I cannot even recall the last time I saw this ineptness. To top it all off Obama got his extension into the 2012 election. We are going to get downgraded because the cuts, spending and taxes, are not deep enough. Congress would have been better off with a one sentence Bill that increased the debt limit until April and then got out of there. Where ever you are make sure you let your represnetative know your feelings by expressing yourself at his townhall meetings or visit their offices if they prefer to not come out in public. Lets see if I phrased this correctly, we needed to borrow money so we could pay the interest on the money we already borrowed, else go in default. Boy are we in trouble. Seamus, I posted at lease two statements that Dent made, and about this issue, and BEFORE this vote. He has been out front on this. If he was out in front of it, which of his ideals or suggestions made it to the bill? Yes, but that is not the worst part. The worst part is that the biggest federal engine right now is the printing press at the federal reserve, which is printing trillions of dollars to pay its bills. Some economists predict that this excessive printing will cause the value of the dollar to plummet, and that will cause massive inflation. By the year 2020 or before, the US is expected to be spending 50% of its budget on the interest payment for the federal debt alone. The only way to do that is to print even more money, that will escalate inflation from 10% to 100%, killing the world economy. Jon, You have been completely unwilling to consider the possibility that the taxes you wish to impose on job creators will stifle our employment. If someone has a view that differs from your own edicts, he is a "hack" or an "idiot." You ridicule the notion of Americans coming together and working together to solve problems. It is actually intolerant people like you, on both the right and the left, who are causing this problem. 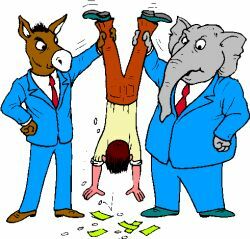 Just as the tea party is moving Republicans to the right, Moveon and people like you are moving Democrats to the left. This is why independents should be allowed to vote in primaries. Unfortunately, you do not play for Team Full Employment, or would be considering all the possibilities. And that is because you are a partisan. Pigpen, your comments are unwelcome here unless you act like a grownup. "If he was out in front of it, which of his ideals or suggestions made it to the bill?" How about the no-tax increase part for starters? I don't know where you get your information but it is certainly tainted and one-sided. And please, before you roll your eyes again, read what I have to say and give it some thought. You would be correct about the printing of money if, indeed we only looked at one side of the balance sheet ledger (Government), which is exactly what you are doing. On the other side of the ledger (Private Sector) you have debt destruction occurring, and likely to continue on for many, many years. See, back in the 1990s and 2000s there was an inordinate amount of money "printed" by the Shadow Banking System. The big investment banks - Morgan Stanley, Goldman Sachs, Lehman Bros., Bear Sterns - due to deregulation were allowed to lever up to 30-to-1 from 10-to-1. For every $1 they had to invest they created $30, not $10 as the previous regulatory limited. So for every Billion Dollars they were able to "print" $30B. This did two things. First, it caused more money to chase assets which pushed up "values" on things like your house. Second, it compounded the risk in the system. See, if you are levered 30-1 if the asset you hold loses 3.5% of it's value you are completely wiped out. This is why Lehman and Bear no longer exist and Goldman and Morgan should have been wiped out as well. Joe Average got caught up in all of this and levered up their house to purchase flat screen tvs and vacation in Hawaii. Now, Joe Average has negative equity in his house (which FYI, that is deflation, not inflation). My point is that there is real deflation happening while you have commodity inflation (higher food and gas prices) that will continue for many years as the debt destruction continues. We are in a balance sheet recession, not a typical run of the mill economic downturn. For a more in depth explanation of what this is Google "Richard Koo Balance Sheet Recession." And regarding the $28/gal gas you expect to see ... no. There is this thing called market forces that will keep that from happening. See, just like in 2008, people will start to make the necessary choices to cut the demand for oil/gas when prices get too high to tolerate. This includes purchasing more economic cars and taking public transportation. And to be honest, if you drive an SUV or other gas guzzler then you are currently a part of the problem, not the solution. The choices you make matter. If you currently have a vehicle that costs you $100 to fill up and you only get 320 miles out of it I feel no pity for you. Everyone needs to take personal responsibility and make smart, economically rational decisions. Before you talk about the Fed "printing money" and adding to inflation, etc. you need to get more informed. This article from the WSJ http://blogs.wsj.com/economics/2010/12/22/is-the-fed-printing-money/ explains more clearly what is happening and it's nothing like you've described. We all need to get it straight before we espouse things as "facts". Let me point out a glaring inconvenient truth. The economists who spout off this giant economic explosion are not the award winning, Nobel prize economists. The prize winning economists are the nations economical cheerleaders who are quoted all over the WSJ. They work for wall street and have an intrinsic effect on providing only the good news . They are the ones who will stand out in front of the USA saying everything is fine, nothing is wrong. The grim reapers are the ones who wrote the 2006 book predicting the collapse, and continue to tell the truth about the actual state of the economy. You, and all other non-belivers are in the denial stage of economics. When the explosion happens, and it will, there will be no more infighting in Washington. Everyone will be too busy searching for gold, and searching for bread. The only issue I was addressing was your claim that the Fed is/was literally printing money and flooding the market which will cause inflation. That is patently false. To the broader issue of the economy in general, I do choose to listen to a Nobel prize winning economist who is NOT part of Wall St., Paul Krugman. I can't wait to hear you howl about his progressive, Keynesian economic theories. No one in Washington (certainly not in the White House) is listening to him and we will all suffer for it. Government cannot be compared to a household as the pundits love to do. Government is a completely different type of entity with a completely different role. Unless of course you're one of those that believes the nonsense being spouted by tea party. Wait until all you folks who want small, lean government get what you ask for. Reality, what a concept? A well run government is what we should all be demanding, size is secondary. Like I said before, there are economists who believe that the crisis coming is unavoidable and will be devastating to the entire world. When all of the printed money starts to hit the cash supply that runs the world, we're in big trouble. That has not happened yet, and I hope it doesnt, because life wont be comfortable for rich or poor. The investors from the People's Republic of China have a front row center seat to these US treasury bond auctions. Why is that? They know they are buying junk bonds, and holding them to prop-up the worth of the dollar. They also know that no market manipulation in the world's history can actually stave off the dollar value from total decline. When other investors pull capital out of the US dollar investments, China will have a temporary champagne party because their exports will be very costly for Americans. They will reap the harvest that they have sewn. But when the dollar value declines even more as the other investors pull away, the champagne party will end, and China's economy will be in ruins because demand will hit rock bottom. They know this, and continue to buy the American junk bonds. Let me suggest you read some history. Start with The Lords of Finance, work over to the Capitalist Manifesto, anything by John Maynard Keynes, Jefferson and Franklin on Debt, The Inflation Deception. After you read those come back and tell Trish she is wrong. She is right on the money with every word she has stated. As the huntress I sugges you start looking out for the wolves. I must apologize, I did not read down far enough to realize that you were relying on Paul Krugman. You really need to look at those other sources I mentioned in my firsr comments. Krugman is nothing but a sop for this admministration. The Fed has been printing and pumping money into the economy for ages. This is why folk are upset about the Fed.Greenspan warned that we were feeling too rich and that is because he knew there was to much money in circulation. People, myself included, originally laughed at his statement. Since this has started Bernanke has done Q1 and Q2 and said there might be a Q3. When asked about it he quickly retreated. We will just have to wait and see which economics theory presents itself in the future. I am relying on the economists that were head on correct in 2006 with their market prediction, and lay out a very grim, very disturbing future for this country. The cheerleader, prize winning economist Krugman believes that the government should be a philanthropic organization. Thats all well and good, but when the Americans wage earners are stagnant at 1980's wages, there is no money to pay for it all. I wonder who will say "I told you so". I pray its not you and me. If our government acts very quickly to reduce this 16.4 trillion mega toxic, then we may have a chance at being wrong. I hope we are wrong. I pray we are wrong, but reality might rear its ugly head, and soon. Greenspan is one of the many reasons we are in this mess, a champion of deregulation and a student of Ayn Rand. Biggest mistake was putting this guy on a pedestal. As for history, you should read some yourself. If Hamilton hadn't struck a deal with Madison to allow for an assumption of debt after the Revolution, the USA would perhaps have resembled something more like the European nation states pre-EU. By the way, Jefferson took great pride in brokering that deal. As for Krugman being a "sop" for this administration, I wish. Might I suggest that you both read "The End Game" by John Mauldin. If you don't know the name you should. He is one of the best, most realistic economists I have read, and I am familiar with them all. He is not a Keynesian and he is not from the Austrian school. The book is somber to say the least. He recently met with 9 senators to discuss his book and understanding of the current economic situation. There were both Rs and Ds in the room. We have come through what can be called a Minsky Moment and are now suffering the consequences of the almost two decades of an overly stable economic situation. (Basically the longer the period of economic stability the harder the economic crash is on the other side). In retrospect, we would have been much better off if we had real recessions in 1996, 2001 and 2004 and not the manipulated "Goldilocks economy" that Larry Kudlow used to brag about. Blame Alan Greenspan. I agree with most of what you said, and I have that book. I think we can both agree that financial deregulation by Bush (and I am a repub) was a big mistake. The stability that you mention was really the fake result of the easy credit of the last 2 decades. It has created toxic debt everywhere, because income levels have not increased to pay for it. There is still toxic debt out there, in most credit cards and in many mortgages, and on corporate balance sheets. Sadly, our government tried to help, but created a "no bad loan left behind" program, and bought up most of it. Its part of the 16.4 trillion megatoxic that has no choice but to burst. Yes we agree on what happened and generally on why it happened. Financial deregulation was bad ... really bad. And there is a lot of debt still out there that has to be dealt with. But, your conclusion that we are doomed and will have hyperinflation and $28 gas I cannot agree with. The debt destruction you talk about is the counterbalancing force to the "printing of money." I posted up earlier today a post on this that appears to be in Bernie's spam filter that goes into more detail on this. This is a situation we will be in for quite some time and will really take time to get through. Muddle trough is more of what is likely to happen. I say likely because Washington can still screw it up. Jon Geeting is correct when he says that spending cuts slows GDP and kills jobs. If we react as the Tea Party would like we are living in 1938 again. And that. was not. pretty. The biggest problem we face in Washington is, on economic issues, one side is inept and clueless (Dems.) while the other believe in a fantasy-base economic theory (Rep.). Not good choices. Publius, I'd add one more problem, and in my mind it trumps all - politicians on both sides of the aisle have proven time and again they cannot be trusted. To allow the spending Dems want now, you have to trust that they'll roll it back when the timing is right. I don't believe they will, and the proof was with the Stimulus. How many times did we hear that stimulus spending was not intended to increase the baseline - yet that's exactly what was done? And before anyone thinks otherwise, the Reps under Bush showed they are spenders too and cannot be trusted. We have a large problem in Washington. I agree. The problem is this: Since 1946 being a politician has been about giving people something for nothing. If you were a Dem you would promise more benefits (social security, medicare, etc.). If you were a Rep. you would promise to give more money in your pocket (read:tax cuts). Today and in the foreseeable future, being a politician means that you have to take away the promises of the past. This means higher taxes and less benefits going forward. Here is the second problem: the general public wants what they were promised (more benefits and/or lower taxes) but do not believe that they should pay for it. "Someone else" should pay for it. This goes for both tax cuts and increased spending. There is an old saying that goes "don't tax you, don't tax me, tax the guy behind the tree." These issues will get resolved one way or the other. Either the politicians will get some political will and will make the necessary decisions or it will eventually be forced on them. My bet is on the latter outcome as our elected officials care more about getting reelected than doing what is right and necessary, and because all unsustainable situations will eventually become unsustainable. I hope we are not doomed and I hope we dont see $28 gallon gas, because I will be on roller skates. But, unless this country cuts its appetite for spending, this is very likely. Jon Geeting is wrong because government should not be the driver of jobs or GDP, the private sector should. The private sector should not be choked with the largest corporate income tax in the world, either. 1938 would be easy street compared to what is ahead. It is inconvenient, shocking and uncomfortable, but its the truth. No one can sustain 16.4 trillion in toxic debt. Not the US , and not the world. Publius and Huntress, you have made excellent well informed and common sense remarks. Any legitimate economist will tell you that the full faith and credit of the United States is still a gold standard. That isn't going to change in two years. The deregulation of unbridled Capitalism that started in the 1980's resulted in easier credit, increased consumerism and easy and cheap credit. That is why any "ism" in its pure state is toxic, be it socialism or capitalism. The major problem in discussing this issue with dedicated baggers is they thrive on fear. The most fearful and apocalyptic the forecast the better. It is not the first time 'Fear' has been galvanized in a political movement and it won't be the last. There is no question that the US must get its act together on the debt. The US Market and the world market, which many of these folks refuse to accept are now one and the same, want to see a logical and grownup solution to our problem. A long term realistic plan. This will involve serious budget cuts in all areas(not just the poor and elderly), it will also mean revenue enhancement by fixing the tax code and allowing the wacky Bush tax cuts to expire. This will not result in millionaires and billionaires moving to Canada. It will result in a faster recovery from the debt crises, greater consumer and market confidence and a return to a more responsible and I dare say much humbler life for this country. Just don't try telling the baggers, the only books they read are "Liberals are Demons" and other nonsense by Fox news operatives. To a hopeful future for us all! BA and MED in History from Moravian College and Eaststroudsberg Graduate school was also in the first class of graduate assistance. Taught history in Bethlehem for 32 year.Is that good enough. Have you read Ayn Rand's Atlas Shrugged or any of her works? This woman was brillant. As to regulations, have you ever picked up a current zoning book from your township and their planning book? Read them. Have you ever built a house? Have you looked at the gazillion regulations out there. Every single solitary one of them has a board of something behind them and they are responsible for tremendous amounts of money to all the people in this nation. I have a customer who just spent $25K for her infiltration and grading plan on a lot she purchased for a home she wants to build in the township. She will be spending close to 40k for materials to stop erosion that will then be thrown way. Why do homes cost hundreds of thousands of dollars today. Regulations. Good back and read some more of Jefferson. He abhored debt and believed that each administration should make sure any debt encountered by the administration should paid off by same. I'm just glad the Tea Party really doesn't exist. Otherwise, their control of the entire debate might make a lot of dummies look dumber than they already are. Dent voted for a decrease in the growth of discretionary spending. The Dent plan increases the federal budget until we all die and rot. Entitlements were never seriously considered. Dent's vote is to continue piling debt and avoid tough choices. He's not alone. But his vote is his vote. Completely irresponsible and typical of a beltway mentality that calls taxes "revenues." They're not revenues outside the Beltway. They are taxes. They are a cost. They are an expense. To the sane among us, they are whatever is the direct opposite of revenues. Hats off to Toomey for standing up against the same old charade that Dent fell for easily. The middle wins. The debt piles higher and higher. "Bernie, I posted earlier today and it looks like it got caught up in your filter or something. Please post. Thanks Publius"
I am sorry. That is exactly what happened. I don't know why but it happens to some people more than others. Chris Casey and Donna Rovito are regularly caught in the filter. Your comment is up, and once again, I am sorry. When the central banks around the world stop buying them, mass inflation is inevitable. Hey Chris does your arm ever get tired from patting yourself on the back? Or does your head fit through the doorway? Chris can pontificate all he want..Any moron who thinks we can erase this deficit without new revenue is just a freaking moron.. Imagine running your household with a cuts only approach..Especially when you have a car payment and a mortage..Chris hates union but I'm sure is enjoying his enormous teacher's pension gotten for him by the teacher's union..he's pathetic!! The fact is, we cant fix this deficit at all. It will require time and planning for influx of new revenues and phase-out of spending. We dont have that kind of time. The US debt, which should be the size of a shrub, has been on miracle grow in the last three years, and has grown to the destructive size of the rockafeller center christmas tree with 10,000 high voltage lights. The lights are on , but no one is home. They are all arguing in Washington. WHen this massive tree starts to go helter skelter, because it is only being nourished with junk bonds, the branches will start falling off, and it will eventually collapse to the ground, landing loudly on its furs. It will cause a crater larger than an asteroid bomb, and take down the entire world economy in its path. When we talk of entititlements, let's remember that social security is not one of them. All of my benefits come from my, and my employers, contributions. It is basically a 401k. Poorly run but still a 401k. That is not an entitlement, it is my money. Don't touch the little you give me. Sorry, Bill. it's been an entitlement for a long time. It's arguable that SS's math was never going to work and it's been an entitlement from the beginning. It's a transfer program. And once again your are incorrect. If we had real cuts and that would mean getting rid of baseline budgeting tell me why we would need an increase in revenues. I'll even help you with this one, we wouldn't. You and your fellow union thugs can never get enough of our money to support your lack of work. Why do you not have the nerve to come out from uuder your anonymous ways. So is the way of the coward. Tune in to the US treasury bond auction scheduled for next week. If the results show a large amount of direct buyers, (more than 20-25%) we're in trouble, big trouble. That means the fed is using its own money to buy its own junk. Its technically a failed auction. This is not new. Its being kept hidden from the public. When the fed uses its own money to purchase its own debt, its called a debt spiral. A debt spiral in the scope of 16.4 trillion to be, is a guaranteed world disaster. Fasten your seatbelts! Given the inflation that has hit China, and I have to say that I don't know the percentage of their inflationary debt, do you think China will step up and sell our bonds and what would be the chance of Japan picking them up? Russia might even make a move on this. I don't think England coud do it. England is in almost as bad of shape as the US. They are also printing money. The foreign countries are stakeholders in this upcoming disaster. Phillippnes, I read, already pre-purchased (if I read it correctly) for this auction. China and japan are also major stakeholders. They want to buy, to prevent a disaster., but will they buy? The auction results are posted on treasurydirect.gov. One important observation. The primary dealers (18 different banks) are required to purchase at the auction. I read a recent jaw-dropping article, that at a recent auction, the primary dealers purchased their requirements, them sold them back to the Fed, 1 WEEK LATER, behind closed doors. It also depends on the maturity dates. The biggest hokus pokus is in the long term bond sale. Your question is a loaded one, and I cant speculate . I dont have the expertise. But one thing is for sure...once this printed money scam starts to circulate, or the auction fails, inflation for the US will be disasterous. Basically, we are now at the mercy of the foreign investors, and how much they are willing to purchase. I don't generally provide my educational background unless some one implies that I am stupid because I find a guy like Paul Krugman a sop for the administration or because I listen to Beck and Limbaugh. What I can tell you is that at the age of 66 I am still in the process of learning at a time when I would rather be playing golf with my grandson. Don't misunderstand I am enjoying the reading that I am doing.My real concern is for my two grandaughters, two grandsons and two great grandchildren ranging in age from 20 to 2 weeks. If you don't have grandkids and then great grandkids let me tell you that when you do you will have some unbelievable great feelings for them and you will want them to live in a great place called America. I think everyone on this blog feels the same. Some of the participants here are interested in one type of America, I am interested in another type of America. We come here to debate because Bernie O'Hare provides us with information that stirs our individual political jucies. When we can no longer do that, we are in trouble. I happen to believe we are in a bad spot at the moment. I think we have to get rid of baseline budgeting that is used at all government levels. I believe we need to take care of oursleves and help those less fortunagte then us whatever the reason the exception being one who has made the decision to live off of me and all other hard working tax payers. I believe we need to remove all of the entitlement programs because we cannot continue with them. Heck Lyndon Johnson was told almost immediately that Medicare was going to be a financial problem. We know that government interference in a crisis has contributed to the lenght of that crisis ie. the deperssion under Hoover and FDR. There are a lot of smart people here including guys like Jon Geeting, Trish, Huntress, Publius and some guy name Anonymous particulary the one who wants me to give up my pension. Not going to do that. But let's continue to exchange our views and opinions and maybe we can find someone to replace Charlie Dent. Sorry Bernie but Charlie blew it on this one. That is the best one I have heard in a long time. Keep working on that Ark. The government wants everyone to believe everything is fine, and nothing is wrong. They want you to continue with your surf/turf, potato salad backyard barbecues with grey goose on one table and Sam Adams Pale Ale on the other. The truth is leaking out in various forms of the media. The US debt 16.4 trillion megatoxic is being kept in a lock box at the Federal Reserve. They have this lumbering beast in a sound proof room, under lock and chain, so the mainstream media cant see it. They are placing it in 4 point restraints, hoping to contain this monster. But the monster has grown big and strong with claws and fangs. Its on its way out of the box. Some sources say it has punched holes in the walls. With every punch the great monster delivers to its box, Ben Bernacke topples from his throne onto the floor, and bursts into tears. When it gets out, its headed straight for Wall street. This will be the Great Depression (squared). Think of it as the abominable snowman on meth. So Trish/brenda, other than being the local Glenn Beck, screaming about doom and then schilling for the gold companies in his rants, what do you suggest? I suggest getting out of the stock market immediately, and selling your home to rent, if you can. The beast will hit the economy when the USA reaches its credit limit, and cant borrow more money. That happens when the treasury auctions officially fail. The dollar will be worth nothing. Stock your shelves and lock your doors. It wont be pretty. I've been holding off on the worst of the worst. But I think I will mention it. The economists who believe this (not the economical cheerleaders like Bernanke and Greenspan) also believe, that ,as in the Great Depression, this collapse will be the gate to future world prosperity. They think this because, as in the Great Depression, when the USA converted from gold to paper money, this massive collapse will crush the USA economy, crushing the world economy, and literally evaporating the International monetary fund. When this happens, the world will be forced into one global currency. It will end all of the trade deficit problems, and the foreign exchange rate problems as well. The dollar, Euro, Yen, etc. will become extinct. Temporarily, gold will become the safest place to be, until all nations can agree on one currency. Bad news is that all of the people who have cash in the mattress, will be destroyed. This probably wont happen in my lifetime. If it does, I'll be living well on the surf and turf at Gracedale. Did we all notice the Express-Times article on page 3 today reporting that these Super Committees are probably going to have a tough time making the cuts? I am assuming that all have become familiar with the Audit report on the Federal Reserve Bank and it is not good news. Then you have our own Bernie O'Hare reporting on the very messy housing market here in the valley. It is now time to pay attention if you have not been doing that. The Federal Reserve fought a right to know request all the way to the supreme court and lost. The requestor, Bloomberg Press, wanted the names of the banking institutions who received bailout money from the Fed discount window during the 2008 crisis. You baggers are wackos, with a capital "W". The request was made available to bloomberg press. It was a 29,000 page pdf document that was put on 2 separate CD roms. 29,000 pages of banks that borrowed from the Federal Reserve discount window from 2008 to present. Are NC Restaurants Open During Hurricane? Will the Lehigh Valley See a New University? Donate to Musikfest ... or Lasso Family? $7 Hamburgers at Norco Courthouse? "If the U.S. Government Were a Family ..."
Is It a Double Dip Recession? Black Fly Spraying Along Lehigh River Today! Lebanese Heritage Day This Weekend! Is Santee Road Swale a Public Safety Hazard? Where's Scott Ott These Days?